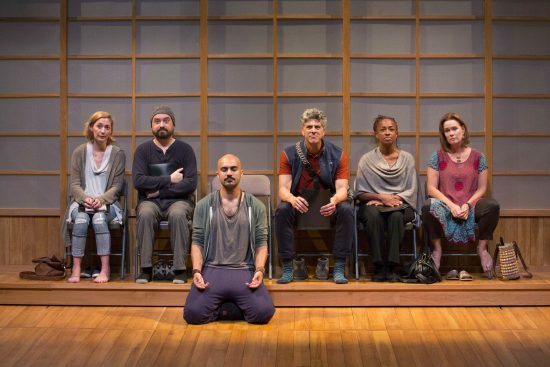 Ancient Chinese philosopher Lao Tsu once said, “Knowing others is wisdom, knowing yourself is enlightenment.” Six strangers take a journey towards both in the delightful dramedy “Small Mouth Sounds,” now playing at Bethesda’s Round House Theatre. The show starts with people arriving at a stark and serene meditation retreat, run by a famous guru (Timothy Douglas). As each of them trickles in, the Guru lays down the rules of the retreat: no smoking, no alcohol, no cell phones, and, perhaps most importantly, no speaking. This is a surprise to at least a few of the attendees, but they all decide to at least try. The attendees are all very different; Jan (James Whalen) has a penchant for confused faces and inappropriate bursts of laughter, Rodney (Maboud Ebrahimzadeh) immediately establishes himself at the top of the class, shunning the folding chair for his own mini-pod meditation pose, Ned (Micheal Glenn) who immediately exudes a nervous, awkward energy, Joan and Judy (Andrea Harris Smith and Beth Hylton) enter loudly arguing about directions and swigging wine, and, finally, Alicia (Katie deBuys), enters late and laden with a ton of literal and figurative baggage. This performance was an emotional triumph that truly took the audience on a personal journey along with the cast. Each of these characters goes on their own journey during this show, but to provide too much detail about what happens to them and what they do in response would be a disservice to you as a potential audience member. The most powerful thing about this show is that in a real way, the audience goes on the journey with these characters, and this reviewer believes that you also “have to live it,” as the characters do. This show is an amalgam of comedy and drama, just as life is. One of the most comedic forces of this piece is the Guru’s participation in the action – he seems to become increasingly scattered and unhinged throughout this show. While this produces some moments of hilarity, it also becomes the impetus of the deepest message of the show. That on this journey to find themselves as individuals, they find the most meaning through the connections that they make with each other. It is a beautiful message of empathy; one that is most welcome in the times we live in. This cast is small but mighty, everyone perfectly suited to both their character and also the larger challenge of conveying that character without the support of much dialogue. Whalon turns in a charming performance as Jan, delivering light-hearted chuckles as well as an emotional turn under the influence of a cocktail of drugs. Ebrahimzadeh provides a revealing (in more ways than one) turn as Rodney. While he started out acting superior to the other participants, he takes a journey of growth that rivals anyone else. Harris Smith and Hylton have the unique challenge of portraying a couple at the retreat together. Not only did they have to navigate their own personal journeys, but their relationship’s as well. 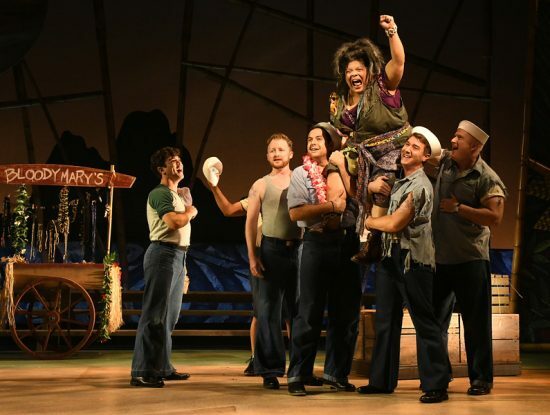 Harris Smith’s steely exterior is revealed to be a coping mechanism through her deft performance and Hylton’s emotional portrayal of Judy had a complexity that was impressive. deBuy’s Alicia is soaked in insecurity and anxiety, again taking an emotional journey. But for this reviewer, the standout was Glenn’s Ned. In one of the rare speaking sections, Ned shares his difficult life story with the Guru; turning in an incredibly emotional roller-coaster ride that was a stunning achievement of feeling. Douglas also delivered a great performance, albeit unseen. This Off-Broadway gem kicks off Round House Theatre’s 2018-2019 season, which brings a dynamic selection of shows and the dawn of a 4-year strategic plan for the theatre. There is also the launch of the residence artist program, which welcomes two actors and two designers to provide more direct input for the season’s shows right from the beginning of the artistic process. They are also commissioning 30 new plays from female and playwrights of color. Finally, they are also undergoing a major renovation, that will be unveiled next season. This performance was an emotional triumph that truly took the audience on a personal journey along with the cast. I’d strongly recommend taking this journey yourself, if only to remind yourself that you are not alone. “Small Mouth Sounds” runs now through September 23rd, 2018. For more information on tickets, click here.